What is the "third revelation" and what are the other two revelations? The first revelation can be called the Sinai Revelation, in which Moses has laws handed down to him directly from God who is the Great I AM for Moses and the Hebrews. The next or second revelation can be called the Palestine Revelation, in which Christ comes to Earth in the form of a man to bring a new set of principles, a New Testament, to replace the strict laws of Moses, and in addition He brings an "I Am" to bestow upon every human being on Earth from then on. The third and present revelation does not have a specific place on Earth, but involves all of the planet Earth, and therefore can be called the Earth Revelation. It is the return of Christ in the etheric plane to Earth. As in the second revelation, Christ is the main figure in the third revelation, but He does not take the form of a physical human this time, but rather He appears in spiritual (etheric) form to human beings all over the Earth when they call upon Him in their time of need. In the Sinai Revelation, it is Moses carrying stone tablets on which God has written his law. Stone is one of the hardest materials of the physical world. In the Palestine Revelation, it is John the Baptist who is the voice crying "in the desert" or the "in the desolation of the soul" for humans to make way for the appearance of the Christ in a physical body on Earth. Whereas the old testament laws had appeared in un-living stone during Moses's time, the new testament will appear in the living human form of Jesus's body. 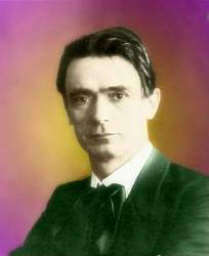 In the Earth Revelation, it is Rudolf Steiner who is the voice crying in the desert in the early 20th Century. He is announcing the imminent return to Earth of Christ in an etheric body — not an unliving stone, not a material based living human, but a living spiritual Being who will be available to all human beings who call upon Him. In other words, Steiner in his time was announcing to us that Christ will return in glory as predicted in the New Testament of the Palestine Revelation, and this return will occur before the middle of the 20th Century. Two things about this revelation, no doubt, will be hard for certain people to accept: 1) That the Second Coming of Christ in glory "riding on the clouds" does not involve a physical body nor physical clouds. The "clouds" of the Bible was a metaphor for the etheric plane, a metaphor which enabled the Gospel writers to communicate an otherwise ineffable concept to the people of their time, and 2) The Second Coming of Christ has already occurred by the turn of the 21st Century. Hard as these two things may be to accept, there are signs, evidence of them all around, for those who will look for them. To understand why these two things will be so hard to accept for a majority of people, Steiner uses an analogy to an area of his own expertise, educating young children, an expertise that has infused the Waldorf and Steiner School systems flourishing all over the world. [page 4 — 5] These three revelations — the one now to come and the two others — may be best understood when compared with the early development of a child. Observing the child rightly, we find that on its first coming into the world it has to be protected and cared for by those around it; it has no means of expressing what is going on within it or of formulating in thought what affects its soul. To begin with, the child cannot speak, cannot think; everything must be done for it by those who have received it in their midst. Then it starts to speak. Those who watch it attentively — this is mentioned in my book, The Education of the Child — will know that first it imitates what it hears; but that in the early days of talking it has no understanding which can be attributed to thinking. What the child says does not arise out of thought, but the other way round. It learns to think by talking; learns gradually to apprehend in clear thought what previously it was prompted to say out of the obscure depths of feeling. [page 5] Thus we have three successive periods in the child's development — a first period when it can neither speak nor think, a second when it can speak but not yet think, and a third when it becomes conscious of the thought-content in what it says. With these three stages in the child's development we may compare what mankind has gone through — and has still to go through — since about 1,500 years before the Christian era. Let's take an example of a child of about twelve who gets hold of his dad's magazine with adult jokes in it and comes across one column in which the author refers to his wife as his "Shirt-Sharpener." This child knows what a shirt is and knows what it is to sharpen knives and pencils, but putting a sharp edge on a knife or sharp point on a pencil seems to have nothing whatsoever with one does with a shirt. "Certainly his wife does not roll his shirt up and put it into a pencil sharpener!" the child thinks. But, try as he might, he cannot conceive of any meaning to the term. In the same magazine a racy picture of a woman in a low cut blouse appears each month and is labeled an "Iphiler." This word registers absolutely no meaning in his mind whatsoever. "What is an "IF-FILLER?" he wonders, and wonders, and wonders. It is to him as if he can say the words, but has no thought content to go with what he is saying. Later he will grow up to understand the word "sharp" can refer to the way a man looks in a freshly ironed shirt, and a wife who makes his shirts look sharp could be called a "Shirt-Sharpener." He will also later come across the expression for a gorgeous woman, "Eye-Filler" and realize in a flash the meaning of "Iphiler." First he must hear the words, say the words, and only later come to add some "thought-content" to the words. This is the path we all have followed in our learning. It was the path that humans followed in their understanding of the first two revelations of Sinai and Palestine. The Sinai Revelation given to Moses came at a time when human beings were like children who could neither speak nor think. [page 7] If in the Ten Commandments men have received guidance from outside, this guidance may be compared to what happens to the child before it can either speak or think. What is done for the child by its environment is achieved by the old Jewish law for all mankind, who until then have, as it were, lacked the power of speaking and thinking. The Palestine Revelation gave us the New Testament at a time when human beings were like children who were capable of speaking, but as yet lacked "thought-content" to go with their speaking ability. Over the past two thousand years, humans have studied the Gospels and begun to develop some degree of "thought-content" in the present time, but like our twelve-year-old boy, there are things that are completely puzzling about such texts as fill the New Testament, even now. [page 7] People, however, have now learnt to speak — or, rather, have learnt something that may be compared with a child's learning to speak: they have gained knowledge of the Mystery of Golgotha through the Gospels. And the way in which they first understood the Gospels may be compared with how a child learns to speak. Through the Gospels there has come to human souls and human hearts some degree of understanding for the Mystery of Golgotha, which has found its way into human feelings and perceptions, and into the soul-forces arising in us when, for example, we allow the deeply significant, intuitive scenes and pictures drawn from the Gospels by great painters to work upon us. While the images of the Gospels may work on us at a deep intuitive level, Steiner tells us that consciously "at the present the Gospels are no better understood than the child understands what it says before it can think." In Steiner's time, early 20th Century, we may understand clearly that even the most erudite and learned professor of theology was as helpless to clarify the Gospels for us as a child of that time would have been to create thought-contents from his father's joke magazine or her mother's romance novel. But, we have already entered the 21st Century and the third revelation, the Earth Revelation, has already happened. [page 8] In this connection we are now moving towards the third period, which may be compared with how the child learns the thought-content in its own speech and can become conscious of it. We are approaching the revelation which should give us the full content, the thought-content, of the Gospels — all they contain of soul and spirit. From whence is this full content, "the thought-content of the Gospels" to come? It will come from a preparation in spiritual science. Without such a preparation the information that will come to one will seem like hallucinations and seem to be useless. Steiner gives us an example of the intervention by Christ in human destiny. [page 10] There will be people, for instance, who, while carrying out some deed, suddenly become aware . . . of an urge to refrain from what they are doing, because of a remarkable vision. They will perceive in a dreamlike way what appears to be an action of their own; yet they will not be able to remember having done it. Such events of perception of one's karmic destiny occurred to humans at the time of Palestine Revelation when they looked into Christ Jesus's eyes and saw the karmic consequences of their deeds laid out for them. In an insightful and revealing scene in the movie "Ben Hur," Jesus comes to Juda ben Hur's aid with water. The guard who had moments ago prohibited anyone from giving Juda any water comes up angrily to lash out at this interloper who was blatantly ignoring his orders, but upon seeing Jesus's face, the guard backs off, his face screwed up in intense trepidation, exactly as if he had seen the karmic consequences of the deeds of his own life. What happened to those in Jesus's time who experienced Him in the flesh has begun to happen to those today who experience Him in the etheric or glorified body. [page 10] Those who are not prepared for such a thing to happen in the course of their evolution will look upon it merely as imagination run wild or as a pathological condition of the soul. Those, however, who are sufficiently prepared through the new revelation coming in our time to mankind through spiritual science — through, that is, this third revelation during the latest cycle of mankind - will realise that all this points to the growing of new human faculties enabling men to see into the spiritual world. They will also realise that this picture appearing to their soul is a forewarning of the karmic deed that must be brought about — either in this life on earth or in a later one — to compensate for what they have done. As people gradually develop the ability to envision these karmic compensations for their present deeds such that they will be deterred from performing them, occasionally the figure of Christ in an etheric body will arise before them as their counselor. In this next passage Steiner said "the time is coming" over ninety years ago, so we can be sure that the time to which he was referring is upon us. 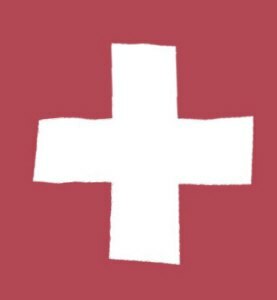 [page 11] The time is coming when human beings, when they feel depressed and miserable, for one or other reason, will increasingly find the help of their fellows less important and valuable. This is because the force of individuality, of individual life, will count for more and more, while the power of one man to work helpfully upon the soul of another, which held good in the past, will tend constantly to diminish. In its stead the great Counsellor will appear, in etheric form. Steiner has said in several places that the time for prophets has passed. What he meant by that is emphasized in a direct way in the above passage: the time when one powerful and insightful person will be required to tell us what to do with our lives has passed. From now on each one will be able to know from one's own "I Am" — the "force of individuality" — which paths to take in life and which paths to avoid due to the negative karmic consequences which would ensue, in other words, due to the offsetting deeds one would be required to perform in a future lifetime to balance the negative deeds one might otherwise perform in this lifetime. [page 11, 12] For those people who have already prepared themselves here for the Christ-event of the 20th century, it will make no difference whether they are in the physical body, when this event becomes a widespread experience, or have passed through the gate of death. Those who have passed through will still have the right understanding of the Christ-event and the right connection with it, but not those who have thoughtlessly passed by this third great forewarning to mankind given through Spiritual Science. For the Christ-event must be prepared for here on earth in the physical body. Those who go through the gate of death without giving even a glance into Spiritual Science during their present incarnation, will have to wait until their next before gaining a right understanding of the Christ-event. It is an actual fact that those who on the physical plane have never heard of the Christ-event are unable to come to an understanding of it between death and rebirth. They, too, must wait until they can prepare for it on their return to the physical plane. The above passage contains an amazing revelation by Steiner: those who died before the third revelation, the Christ-event, the Second Coming of Christ in the etheric plane to Earth in the middle of the 20th Century, will have the right connection to the Christ-event, while those who die after the Christ-event ignoring this revelation will have to return in another incarnation to gain that connection. Christ, in this new form will be able to appear in many places at the same time, in fact, He will appear to anyone who earnestly calls upon Him. [page 13] His help will be forthcoming at the same moment here, there, and everywhere. And as a spiritual being is not subject to the laws of space, anyone who can be helped by Christ's direct presence is able to receive that help at one end of the earth just as well as another person at the opposite end. Only those unwilling to recognise the progress of mankind towards spirituality, and what gradually transforms all the most important events into the spiritual — only these persons can declare that what is implied by the Christ-being is limited to a physical body. One of the consequences of studying spiritual science (or anthroposophy, which is, as the etymology of the name implies, the "knowledge of the full human being of body, soul, and spirit") is that one is able to understand the thought-content of the Gospels. Otherwise one would only be able to speak of as a child is able to parrot word and phrases that it has heard from others but which it does not understand. [page 14] The Gospels are the language, and, in relation to them, Anthroposophy is the thought-content. As language is related to a child's full consciousness, so are the Gospels related to the new revelation that comes directly from the spiritual world — related, in effect, to what Spiritual Science is to become for mankind. We must be aware that we have in fact a certain task to fulfil, a task of understanding, when we come — first out of the soul's unconscious depths, and then ever more clearly — to discern our connection with Anthroposophy. We must look upon it, in a sense, as a mark of distinction bestowed by the World-Spirit, as a sign of grace on the part of the creative, guiding Spirit of the world, when to-day our heart urges us towards this new announcement which is added, as a third revelation, to those proclaimed from Sinai and then from the Jordan. To learn to know man in his entire being is the task given in this new announcement - to perceive ever more deeply that what we are principally conscious of is sheathed around by other members of man's being, which are nevertheless important for his life as a whole. We can have no greater possible incentive to study anthroposophy than to be able to understand the thought-content of the Gospels and we must accept it as a sign of grace that we are given this understanding and ability by virtue of being able to read these two lectures that Steiner gave in Nuremberg, Germany in 1911. When we consider the path that Steiner's originally spoken words have taken on their way into our minds, we should indeed be humbly grateful to all the hands these words have passed through on their way to us. And, even as we pause in gratitude, many others are scoffing at us in what they consider to be our folly. In this age of individual freedom, one can freely choose one's world view. Many have chosen the scientific world-view in which life is merely a side-affect of the evolution of material substances, a random mixture of biological soup in primordial times that mysteriously evolved into the teeming species we know today. Thus, to such individuals the contents of this review and all of Steiner's life work is pure poppycock, balderdash, and hallucinatory babbling. One should disabuse oneself of any notion that Steiner was unaware of such strongly held opinions. [page 15] Many of those who, on account of their so-called scientific world-conception, have become arrogant and overbearing, now say: "The ages of faith are long past; they were fit for mankind in their stage of childhood but men have now progressed to knowledge. To-day people must have knowledge of everything and should no longer merely believe." Incapable of understanding the thought-content of the Gospels and modern anthroposophy, and, content with their childish parroting of their own faith in the metaphysical(1) reality of the material world, they accuse anthroposophists, who know better, of the very failing that can be so prominently seen in their own epistemology. This level of projection is so great that it is considered by such scientists to be unworthy of debate because it is so blatantly "true" from their perspective — a perspective which necessarily blinds them to the very reality they claim is non-existent! Those who truly understand spiritual science are like sighted humans in the kingdom of the blind, but rather than being sought for their extended knowledge, they are treated like lunatics and are reviled or ignored, up until now. Many materialistic scientists, however, no matter how hard they try to avoid it, will catch glimpses of the karmic consequences of their opinions and begin to see the light in coming decades. Steiner asks an interesting question: "Does faith mean anything for humankind?" In other words, does it make any difference in one's life on Earth if one has no faith? And if it does make a difference, exactly what difference? Steiner throws the question on its ear by asking another question in its place: "Does health mean anything for humankind?" In other words, does it make any difference in one's life on Earth if one ignores one's health — if one looks upon health as if it were in endless supply — as so many young people are wont to do, as they drink, smoke, eat, and party to excess? The two processes are parallel, Steiner tells us, and the consequences to either behavior are predictably sad. The forces of health are necessary to the body and the forces of faith are necessary to the soul. [page 15] It is not for man to decide whether to lay aside faith or not; faith is a question of life-giving forces in his soul. The important point is not whether we believe or not, but that the forces expressed in the word 'faith ' are necessary to the soul. For the soul incapable of faith becomes withered, dried-up as the desert. "Oh, come on," I can hear some of you saying as you read this, "what difference will it make in my life if I have faith or not?" Let me ask those of you who might say that, "Do you not see a world about you in which people's lives are undermined by fear, care, and anxiety?" [page 16] If we do not possess forces such as are expressed in the word 'faith', something in us goes to waste; we wither as do the leaves in autumn. For a while this may not seem to matter — then things begin to go wrong. Were men in reality to lose all faith, they would soon see what it means for evolution. By losing the forces of faith they would be incapacitated for finding their way about in life; their very existence would be undermined by fear, care, and anxiety. To put it briefly, it is through the forces of faith alone that we can receive the life which should well up to invigorate the soul. Now we reach the point of the first word of the title of these lectures, "Faith" — we find that the most important forces of the astral body (soul) are those of faith, so we can call the astral body the "faith-body" equally as well. From the familiar passage in St. Paul's letter to the Corinthians, 1 Cor 13:13, "But now abideth faith, hope, love, these three; and the greatest of these is love," we have tended to place faith, hope, and love in this order. But notice that this order was only required so that St. Paul to talk about the last item, love (otherwise called charity or agape ), in the latter part of his sentence. In the title of these lectures, Steiner reveals to us the proper order of these three items, namely, faith, love, and hope. We shall see presently why this is the proper order. [page 16] A second force that is also to be found in the hidden depths of a man's being is the force expressed by the word 'love'. Love is not only something linking men together; it is also needed by them as individuals. When a man is incapable of developing the force of love he, too, becomes dried-up and withered in his inner being. We have merely to picture to ourselves someone who is actually so great an egoist that he is unable to love. Even where the case is less extreme, it is sad to see people who find it difficult to love, who pass through an incarnation without the living warmth that love alone can generate . . . The love-body is the body known in spiritual science as the etheric body, and we find that the most important forces of the etheric body are those of love. If you can think of a man who is so egotistical that all he loves is money, even that kind of love is essential for sustaining his life body or etheric body — for without that sole avenue of love, he would die. The love of money may be the "root of all evil" but it can also be shown to be the root of life for some who would else have no other reason for living, as witness those who jumped to their death in the Great Crash of 1929 when the root of their lives, money, had disappeared overnight. [page 17] If a man could completely empty his being of the force of love — but that indeed is impossible for the greatest egoist, thanks be to God, for even in egoistical striving there is still some element of love. Take this case, for example: whoever is unable to love anything else can often begin, if he is sufficiently avaricious, by loving money, at least substituting for charitable love (RJM: agape ) another love - albeit one arising from egoism. For were there no love at all in a man, the sheath which should be sustained by love-forces would shrivel, and the man, empty of love, would actually perish; he would really meet with physical death. In spiritual science we learn that the "I Am" or Ego of the human being is wrapped or enclosed by the astral body (faith-body) which is wrapped or enclosed in a sheath called the etheric body (love-body) which is enclosed in the sheath called the physical body which we will learn is also called the "hope-body." Anyone who has ever had a close call with death will know how difficult it is to carry on with any normal life when one is facing the possibility that one might not be alive tomorrow. Without hope for tomorrow, how can one carry on? Without hope for tomorrow, how can life have any meaning? [page 17, 18] If we go further, we come to another set of forces we all need in life, and if we do not, or cannot, have them at all — well, that is very distinctly to be seen in a man's external nature. For the forces we need emphatically as life-giving forces are those of hope, of confidence in the future. As far as the physical world is concerned, people cannot take a single step in life without hope. They certainly make strange excuses, sometimes, if they are unwilling to acknowledge that human beings need to know something of what happens between death and rebirth. They say: "Why do we need to know that, when we don't know what will happen to us here from one day to another? So why are we supposed to know what takes place between death and a new birth?" But do we actually know nothing about the following day? We may have no knowledge of what is important for the details of our super-sensible life, or, to speak more bluntly, whether or not we shall be physically alive. We do, however, know one thing — that if we are physically alive the next day there will be morning, midday, evening, just as there are to-day. If to-day as a carpenter I have made a table, it will still be there tomorrow; if I am a shoemaker, someone will be able to put on to-morrow what I have made to-day; and if I have sown seeds I know that next year they will come up. We know about the future just as much as we need to know. Life would be impossible in the physical world were not future events to be preceded by hope in this rhythmical way. Would anyone make a table to-day without being sure it would not be destroyed in the night; would anyone sow seeds if he had no idea what would become of them? How can we tell if someone is suffering from lack of hope in their life? Steiner tells us, "Nothing makes for deep wrinkles, those deadening forces in the physical body, sooner than lack of hope." Is it easier to understand now why some people are wrinkled at fifty and others remain wrinkle free well into their nineties? And is not osteoporosis more prevalent now than at any previous time in history? How many elderly relatives do you know who have had a broken leg, arm, hip, or pelvic bone from a simple fall? Osteoporosis is merely a new name for rickety bones, only the new name is primarily applied to the elderly, but the cause is the same: a lack of minerals such as calcium accumulating in the bones. In the next passage we can see that this disease stems from a lack of hope in the world, up until now. [page 20] This power of hope arises through the certainty of knowledge gained from the laws of karma and reincarnation. Already there is a tendency in human beings to produce withering bodies, which in future would become increasingly rickety even in the very bones. Marrow will be brought to the bones, forces of life to the nerves, by this new revelation, whose value will not reside merely in theories but in its life-giving forces — above all in those of hope. At last we are able to see that the correct order is faith, love, and hope because this is the order of the sheaths that enclose the human "I Am" or Ego as we look inward: the astral body (faith-body), the etheric body (love-body), and the physical body (hope-body). [page 20, 21] It is true that faith, love, hope, are sometimes put in this correct order; but the significance of the words is so little appreciated that we often hear faith, hope, love, which is incorrect; for you cannot say astral body, physical body, etheric body, if you would give them their right sequence. That would be putting things higgledy piggledy, as a child will sometimes do before it understands the thought-content of what is said. It is the same with everything relating to the second revelation. It is permeated throughout with thought; and we have striven to permeate with thought our explanation of the Gospels. For what have they meant for people up to now? They have been something with which to fortify mankind and to fill them with great and powerful perceptions, something to inspire men to enter into the depth of heart and feeling in the Mystery of Golgotha. But now consider the simple fact that people have only just begun to reflect upon the Gospels, and in doing so they have straightway found contradictions upon which Spiritual Science alone can help to throw light. Thus it is only now that they are beginning to let their souls be worked on by the thought-content of what the Gospels give them in language of the supersensible worlds. In this connection we have pointed out what is so essential and of such consequence for our age: the new appearance of the Christ in an etheric body, for his appearance in a physical body is ruled out by the whole character of our times. It should be clear that this triumvirate, this trinity of Faith, Love, and Hope are all three required in equal measure and that each one infuses and invigorates the other two as we humans live through the rhythmic cycles of our body and the Earth of which we are an integral part. This trinity reminds me of another trinity of "Ever-returning Spring, trinity sure to me you bring." written by Walt Whitman in his famous poem, "When Lilacs Last in the Dooryard Bloomed." Would we plant seeds in the Fall if there were no "ever-returning Spring" coming to greet them when the seedlings finally poke their head from the ground to give us hope for the flowers? there's hope for the flowers. Pours on us His blessed showers. 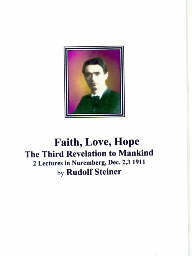 The second lecture on Dec. 3, 1911 Steiner begins by telling us a story of parents who lost a beloved son unexpectedly. They mourned for many months after he was buried. One night their son appeared to them in a dream saying that he had been buried alive, having been only in a deep trance, and that they could confirm that was the case if they looked into it. The parents tried desperately to get authorities to exhume the body, to no avail. Steiner explains to us how this dream came about in order to show us that dreams come to us in disguised form in our time whereas among the early Christians dreams were able to show humans exactly how things stood with the dead. [page 27, 28] Now picture to yourselves vividly the parents, with their thoughts engrossed by this beloved dead son. Even in sleep the connecting links were there. Just at the moment when both father and mother began to dream, the son, in accordance with the state of his soul, had a particularly keen desire that we may perhaps clothe in these words: "Oh! If only I were still on earth in a physical body." This thought on the part of the dead son sank deep into his parents' soul, but they had no special faculty for understanding what lay behind the dream. Thus the imprint of the thought on their life of soul was transformed into familiar images. Whereas, if they could have clearly perceived what the son was pouring into their souls, their interpretation would have been: "Our son is longing just now for a physical body." In fact, the dream-image clothed itself in words they understood — "He has been buried alive!" — which hid the truth from them. When our ancient human ability to commune with the dead waned, it was the Christians that felt it the most strongly and they compensated for this loss by the reverence they showed in their religious rites, even to the extent of creating their altars in the shape of coffins. Over time the ability of the general populace to commune with the dead completely disappeared and the altar took its current shape. But along with these changes a new capability began to arise. [page 31, 22] The days are drawing near when people will feel bound to admit: "We have strange glimpses into the past, when we were already on the earth but living in another bodily form. We look back and have to say that we were already then on earth." And among the faculties appearing more and more in human beings will be one which arouses the feeling: It can only be that I am looking back on earlier incarnations of my own. If we study spiritual science, we can avoid "making a torment of our life in future incarnations," Steiner tells us, but he also admits that "at present comparatively few find their way to spiritual science." [page 33] It is perfectly true, and should be realised by Anthroposophists, that refusing to look into Spiritual Science, or Anthroposophy, means preparing a life of torment for future incarnations on earth. That is true, and should not be treated lightly. On the other hand, those who see friends and acquaintances they care for showing no inclination towards Anthroposophy can say: "If I become a good Anthroposophist myself, I shall find an early opportunity, with the forces remaining to me after death, to prove helpful to these souls"- provided the living link we have spoken of is there. And because the interval between death and rebirth is becoming shorter, these souls, too, will have the opportunity of absorbing the Mystery-truths that must be absorbed if torment is to be avoided in men's coming incarnations. All is not yet lost. Undoubtedly Steiner, from his position in the spiritual world, has been proving helpful to those souls with which he had a living link over this past hundred years. He warns us, however, not to accept the thought, "If that is how things are, I need not accept the truths of Spiritual Science till my next incarnation." [page 33, 34] If everyone were to say that, when gradually the next incarnations come, there would be too few opportunities for effective aid to be given. Even if those wishing for Anthroposophy can now receive its truths from only quite a few people, the situation will be different for the countless hosts of those who, in a comparatively short time, will be eagerly turning to Anthroposophy. A countless number of Anthroposophists will then be needed to make these truths known, either here on the physical plane, or — if they are not incarnated — from higher planes. The self-reliance which is coming increasingly to all souls will require everyone to make an increasingly earnest effort to learn about spiritual science or else they will come to experience their greater self-reliance only as greater isolation. [page 35] What then is our present experience? It is not just of the entering-in of the ego; we now experience how one of our sheaths casts a kind of reflection upon the soul. The sheath to which yesterday we gave the name of "faith-body" throws its reflection on to the human soul, in this fifth epoch. Thus it is a feature of present-day man that he has something in his soul which is, as it were, a reflection of the nature of faith of the astral body. In the sixth post-Atlantean epoch there will be a reflection within man of the love-nature of the etheric body, and in the seventh, before the great catastrophe, the reflection of the nature of hope of the physical body. To prepare ourselves for the 6th epoch we must learn spiritual science so that through our familiarity "with the mysteries of the cosmos, with the nature of the various individualities both on the physical plane and on the higher planes, we try to kindle love for everything in existence." By the 6th epoch we can expect to reach the stage that Christ Jesus spoke when he asked us to "love our neighbors as ourself". We will transcend the present stage at which we follow the coercive commandments imposed upon us from without during the Sinai revelation, and instead we will learn to discover out of our innermost being the reasons to operate out of love. We will learn the lesson of Goethe's words (page 38): "Duty — when one loves the commands one gives to oneself." [page 37] Our age will be followed by one in which the need for love will cast its light. Love in the sixth culture-epoch will show itself in a very different form - different even from that which can be called Christian love. Slowly we draw nearer to that epoch; and by making those in the Anthroposophical Movement familiar with the mysteries of the cosmos, with the nature of the various individualities both on the physical plane and on the higher planes, we try to kindle love for everything in existence. This is not done so much by talking of love, as by feeling that what is able to kindle love in the soul is prepared for the sixth epoch by Anthroposophy. with a severely stunted intellectuality. [page 38, 39] At present it is not required of people to combine their intelligence with an equal degree of morality. To all that we have been anticipating for the future this must be added — that as we advance, it will no longer be possible for these two qualities of the human soul to be kept apart, or to exist in unequal measure. A man who, according to the reckoning-up of his previous incarnation, has become particularly intelligent without being moral, will in his new incarnation possess only a stunted intelligence. Thus, to have equal amounts of intelligence and morality in future incarnations he will be obliged, as a consequence of universal cosmic law, to enter his new incarnation with an intelligence that is crippled, so that immorality and stupidity coincide. For immorality has a crippling effect upon intelligence. In other words, we are approaching the age when morality and what has now been described for the sixth post-Atlantean epoch as the shining into the ego-soul of the love-forces of the etheric body, point essentially to forces having to do with harmonising those of intelligence and morality. One can read the works of one man who understood in the late 20th Century the consequence of someone having intelligence without morality. His name is Andrew J. Galambos and it's possible to read the text of his introductory course that he gave to beginning students in his volitional science. This course, rightly understood by very few people, was a very practical study of spiritual science, especially the relationship between morality and intelligence. Galambos laid down the principles by which the long sought after "threefold society" of Rudolf Steiner can be brought to fruition. If the present day mental-giants-but-moral-morons would ever make the effort to comprehend and apply Galambos' work in their own lives, they would soon discover that their morality can rise to the level of their intelligence in this life. The benefit to them is that, in their next life, their intelligence will be harmonized with the level of their morality in this life. The decision between morality with intelligence and morality with stupidity should be easy. One month before Steiner gave these current lectures, he gave two lectures on "Jeshu ben Pandira," which I have reviewed previously. He said that this individuality will be instrumental in helping humankind achieve a balance between intelligence and morality and that this individuality will appear in frequent incarnations for another 3,000 years. [page 39] The other side is this — that it is solely through harmony of this kind, between morality, custom, and intelligence, that the whole depth of the Mystery of Golgotha is to be grasped. This will come about only through the individuality who before Christ-Jesus came to earth prepared men for that Mystery, developing in his successive incarnation ever greater powers as teacher of the greatest of all earthly events. This individuality, whom in his rank as Bodhisattva we call the successor of Gautama Buddha, was incarnated in the personality living about a hundred years before Christ under the name of Jeshu ben Pandira. Among his many students was one who had at that time already, in a certain sense, written down a prophetic version of the Matthew Gospel, and this, after the Mystery of Golgotha had been enacted, needed only to be given a new form. This individuality will be speak words that will flow into one's heart like a healing medicine. This will permit this great teacher to interpret the Mystery of Golgotha in a more direct way than anyone can today. [page 40, 41] This great teacher, who will be able to give to men ripe for it the profoundest instruction concerning the nature of the Mystery of Golgotha, will fulfil what Oriental prophets have always said — that the true successor of Buddha would be, for all mankind, the greatest teacher of the good. For that reason he has been called in oriental tradition the Maitreya Buddha. His task will be to enlighten human beings concerning the Mystery of Golgotha, and for this he will draw ideas and words of the deepest significance from the very language he will use. No human language to-day can evoke any conception of it. His words will imprint into men's souls directly, magically, the nature of the Mystery of Golgotha. Hence in this connection also we are approaching what we may call the future moral age of man; in a certain sense we could designate it as a coming Golden Age. There is a hubris that every generation exudes that could be stated thus: "Ours is the first modern society. Look at our technological advances." Certainly one might say of technology at the start of the 21st Century that we have "wireless installations" by which people can transmit via the Internet our thoughts all over the Earth. And yet when we investigate the situation we find that the most trivial, unproductive thoughts are sent by the new technology, much more than when we depended upon "snail mail" for communication. In the next passage Steiner is talking about the onset of the 20th Century, but notice how clearly his thoughts apply to us a century later. Have things really changed all that much for the better if they can be talked about in such a similar way? [page 42] Ultimately, however, people would ask themselves what they had gained and say: "We have wireless installations — undreamt of by our ancestors - to transmit our thoughts all over the earth, and what good does it do us? The most trivial, unproductive thoughts are sent hither and thither, and human ingenuity has to be strained to the utmost to enable us to transport from some far distant region, by means of all kinds of perfected appliances, something for us to eat; or to travel at high speeds round the globe. But in our heads there is nothing worth sending from place to place, for our thoughts are cheerless; moreover, since we have had our present means of communication, they have become even more cheerless than when they were conveyed in the old snail-like fashion." In the European epoch, we will develop the strong forces of faith, in the Russian epoch, the strong forces of love, and in the American epoch the strong forces of hope. What a sweeping look at the next 5,000 years! One can get no better view of the folly of our materialistically based culture than to see how it will become fodder for those whose maintain a strong connection with the spiritual world from whence the material world springs. [page 42] In short, despair and desolation are all that our civilisation can spread over the earth. But, in the last culture-epoch, souls who have accepted the spiritual in life will have become enriched, as if on the ruins of the external life of culture. Their surety that this acceptance of the spiritual has not been in vain will be the strong force of hope within them — hope that after a great catastrophe a new age will come for human beings, when there will appear in external life, in a new culture, what has already been prepared spiritually within the soul. Thus, if we permeate our whole being with Spiritual Science, we advance step by step, in full consciousness, from our age of faith, through the age of love and that of hope, to what we can see approaching us as the highest, truest, most beautiful, of all human souls. Footnote 1. The adjective metaphysical is used here to refer specifically to the "theoretical principles forming the basis of a science." My point is that the theoretical basis of the physical sciences lies in an unproven belief that the only reality is the one observable with our human sensory apparatus.